48-Station Extended Side Mounted ATC, CAT-40 Taper Spindle, Renishaw Touch Probing System, Renishaw Wear System, Tool Presetting Touch Probe, 12,000 RPM, High Flow Thru Spindle Coolant, Rigid Tapping, Hand Wheel, (2) 21 ¾” x 51” Pallets, Chip Augers and Conveyor, Mazak 4th Axis 8” Rotary Head w/6” Faceplate. 2-Pallet 4-Axis CNC Vertical MachiningCenter s/n 172965 w/ Mazatrol 640M Nexus Controls, 48-Station Extended Side Mounted ATC, CAT-40 Taper Spindle, Renishaw Touch Probing System, Renishaw Wear System, Tool Presetting Touch Probe, 12,000 RPM, High Flow Thru Spindle Coolant, Hand Wheel, (2) 21 ½” x 51 ¼” Pallets, Chip Augers and Conveyor, Mazak 4th Axis 8” Rotary Head. with 6” x 6” x 19” Tombstone 8” x 15” Magnetic Chuck and Support. Wear System, Tool Presetting Touch Probe, 12,000 RPM, Rigid Tapping, 16” x 35 ½” Table, Chip Conveyor, Coolant. 2001 Mazak mdl. VTC-200B 4-Axis Sliding Column CNC Vertical Machining Center s/n 152320 w/ Mazatrol PC-FUSION-CNC 640M Controls, 24-Station ATC, CAT-40 Taper Spindle, Renishaw Touch Probing System, Tool Presetting Touch Probe, 12,000 RPM Spindle, High Flow Thru Spindle Coolant, 20”x 57 ½” Table, Chip Conveyor, Mazak 4th Axis 8” Rotary Head with Trunion, 5C Collet Closer and Support. System, 8000 RPM, Rigid Tapping, High Flow Thru Spindle Coolant, 16” x 35 ½” Table, Chip Conveyor. Center s/n 206550 w/ Mazatrol Matrix Nexus Controls with Voice Advisor, Tool Presetter, 12-Station Live Turret with Upgraded 6000 RPM Live Tooling, 6000 RPM Spindle, (3) Right Hand and (3) Straight Live Tooling Holders, Parts Catcher, 6” 3-Jaw Power Chuck, Chip Conveyor, Coolant. 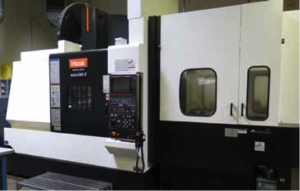 2013 Mazak Quick Turn Nexus 200-II mdl. QTN200-II CNC Turning Center s/n 245638 w/ Mazatrol Matrix Nexus Controls, Tool Presetter, 12-Station Turret, 5000 RPM, Hydraulic Tailstock, 8” 3-Jaw Power Chuck, Chip Conveyor, Coolant. 2000 Mazak Quick Turn 250HP mdl. QT-250-HP-UNIV CNC Turning Center s/n 145594 w/ Mazatrol PC-FUSION-CNC 640 Controls, Tool Presetter, 12-Station Turret, 5000 RPM, Hydraulic Tailstock, Parts Catcher, 10” 3-Jaw Power Chuck, S-26 Collet Pad Nose, Chip Conveyor, Coolant, 2006 SMW “Space Saver 2200” Type SPAC.2200 Automatic Bar Loader / Feeder s/n 18-530. 1999 Mazak Quick Turn 250HP mdl. QT-250-HP-UNIV CNC Turning Center s/n 140828 w/ Mazatrol PC-FUSION-CNC 640 Controls, Tool Presetter, 12-Station Turret, 4000 RPM, Hydraulic Tailstock, Parts Catcher, S-26 Collet Pad Nose, Chip Conveyor, Coolant, CNC Enhancements “Autobar 400” Automatic Bar Loader / Feeder. 1999 Mazak Quick Turn 250 mdl. QT-250-UNIV CNC Turning Center s/n 139763 w/ Mazatrol PC-FUSION 640T Controls, Tool Presetter, 12-Station Turret, 5000 RPM, Hydraulic Tailstock, Parts Catcher, Chip Conveyor, Coolant. Bridgeport Series 1 -2Hp Vertical Mill s/n 200165 w/ Anilam Mini Wizard DRO, 60-4200 Dial Change RPM, Chrome Ways, 9” x 42” Table. Bridgeport Series 1 – 2Hp Vertical Mill s/n 236246 w/ 60-4200 Dial Change RPM, Chrome Ways, Power Feed, 9” x 48” Table. Hardinge mdl. HLV-H Tool Room Lathe s/n HLV-H-636 w/ 125-3000 RPM, Inch Threading, Tailstock, Power Feeds, 5C Collet Closer, Aloris Tool Post, Coolant. DoAll mdl. 15 15” x 34” Geared Head Gap Bed Lathe s/n 136531 w/ 35-1500 RPM, Inch Threading, Tailstock, Steady Rest, Trava-Dial, 5C Collet Closer, Aloris Tool Post. Hardinge HSL Speed Lathe s/n HSL-5C-4815-T w/ 3-Speeds, Cross Slide, Cart Stand. Overbeck mdl. LT-2 Twister Speed Lathe s/n 01681 w/ Variable Speeds, 5C Spindle. 2014 Hexagon Metrology / Brown & Sharpe Global Advantage 5.5.5 Silver Edition CMM Machine s/n 0514-1021 w/ Tesa Star SM Motorized Probe Head, Hexagon Digital Joystick Controller, Work Envelope X=19.7”, Y=15.8”, Z=15.8”, PCDMIS Software, Computer, Printer. 2005 Brown & Sharpe Global Status 5.7.5 CMM Machine s/n 12051110 w/ Renishaw MH8 Probe Head, Joystick Controller, Work Envelope X=19.7”, Y=27.6”, Z=15.8”, PCDMIS Software, Computer, Printer. Starrett mdl. HB400 16” Optical Comparator s/n 51089 w/ Quadra-Chek 200 Programmable DRO, Shadow Detector, Surface and Profile Illumination, Cabinet Base and Accessories. Fowler Sylvac Z_CAL300 11.8” Digital Height Gage w/ Ruby Tip and Accessory Set. (2) Mitutoyo 24” Dial Height Gages. (2) Mitutoyo 12” Dial Height Gages. Mitutoyo mdl. SJ-201 Surface Roughness Gage. (2) Mueller Dial OD/ID Gages. Mitutoyo 8” and 6” Digital Calipers. Mitutoyo and Etalon 12” and 6” Dial Calipers. Obishi-Keiki 12” x 14” Bench Center. Mitutoyo 0-12” and 0-6” OD Mic Sets. Mitutoyo 2”-3”, 1”-2”, 0-1” Digital OD Mics. (2) Mitutoyo 2”-6” Dial Bore Gages. SPI 1.6”-2.0”, 1.4”-1.6”, 1.2”-1.4”, 1.0”-1.2” Bore Mics. Mitutoyo 3”-4”, 2”-3”, 1”-2”, 0-1” Blade Mics. Mitutoyo 1”-2”, 0-1” Anvil Mics. Mitutoyo 1”-2”, 0-1” Point Mics. (3) Mitutoyo and Starrett 0-3” Depth Mics. (3) Intertest Dial Groove Gages. (2) SPI Dial Chamfer Gages. Pin Gage Sets 0.011” to 1.000”. 48” x 60” x 8” 2-Ledge Granite Surface Plate w/ Stand. Standridge 39” x 43” x 6 ½” Granite Surface Plate w/ Stand. Starrett 24” x 36” x 4” 2-Ledge Granite Surface Plate w/ Rolling Base. 24” x36” x 3” Granite Surface Plate w/ Stand. Haas 4th Axis 7” Rotary Head w/ Servo Controller, 16C Pneumatic Collet Closer, Trunion Table and Support with Kurt 6” Angle-Lock Vise.Haas 4th Axis 8” Rotary Head.MMS 9” x 22 ¼” 4th Axis Trunion Table. (3) Custom 4th Axis Trunions. (2) Huot Toolscoot 40-Taper Tooling Carts. (2) Huot 40-Taper Tooling Racks. (20) Kurt 6” Angle-Lock Vises. 15” 3-Jaw, 10” 3-Jaw, 8” 2-Jaw, 3-Jaw and 4-Jaw, 7” 3-Jaw Chucks. 5C Indexing Heads, Spin Fixtures and Collet Closers. 14-Drawer, 12-Drawer and 11-Drawer Tooling Cabinets. 10-Drawer Stainless Steel Maple Top Roll-A-Way Tool Box. Insert Mills, Turning, Threading, Grooving and Boring Toolin w/ Carbide Insets. Drills, Taps, Reamers, Radius Cutters, Broaches and Perishable Tooling. Carbide and High Speed Endmills. 12” x 15” Adjustable Angle Plate. Pneumatic Pad and Disc Sanders. 2003 Toyota Tundra Pickup Truck Lisc# 8H66697 w/ 3400 Four Cam 24 Gas Engine, Automatic Trans, AC, AM/FM/CD, 148,810 Miles, VIN# 5TBJN32163S424063. Toyota mdl. 5FBCU15 2870 Lb Cap Electric Forklift s/n 60448 w/3-Stage Mast, 189” Lift Height, Side Shift, Cushion Tires, Charger. (3) 40’ Storage Containers w/ Shelving and Lights. Economy mdl. CW-54 1500 Lb Cap Electric/Hydraulic ie Lift Cart s/n AC51041A. (2) 1100 Lb Cap Hydraulic Pallet Movers. Wall Mounted ½ Ton Jib w/ CM Electric Hoist. Cantilever and Vertical Material Racks w/ Aluminum and Stainless Bar Stock. Canon Image CLASS MF-6550 Office Copy/FAX/Scanner/Printer. Canon Super G3 ImageRunner 2200 Office Copy/FAX/Scanner/ Printer. Reception Desk and Office Furniture. Misc Office Computers and Printers.